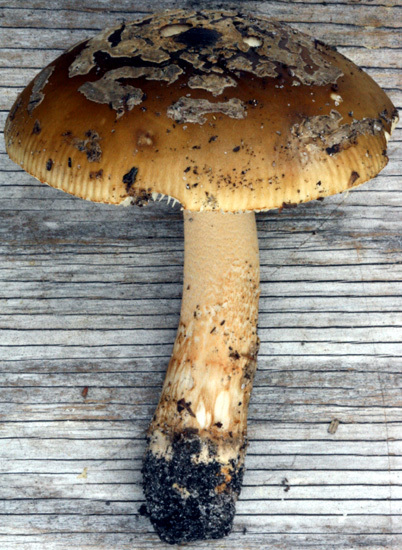 english name "Confectioner's Ringless Amanita"
5. 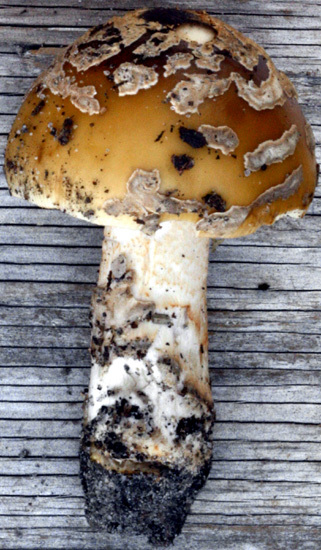 Amanita dulciarii, Franklin Parker Preserve, ca. Chatsworth, Burlington Co., New Jersey, U.S.A. 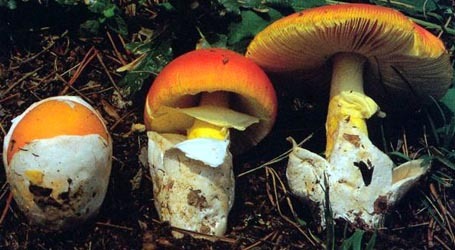 The cap of Amanita dulciarii is 34 - 85 mm wide, at first sometimes tannish yellow over the center and yellow with a slight olivaceous tint otherwise except nearly white at the margin, becoming brassy yellowish brown to brown to yellowish brown over the center with an orangish tint near the margin or brown over the center and slightly reddish brown to orangish brown at the margin or dark brown with reddish tint over the center and brown at the margin or fuligineous over the center and Isabella color or a yellower brown at the margin, sometimes not evenly pigmented and then with the palest region yellowish cream, faintly virgate for about half of the radius near the margin or not noticeably virgate, campanulate at first, then broadly campanulate or subhemispheric to convex to planoconvex often with a low and broad umbo, sometimes in a shallow depression, to nearly planar often with umbo, subviscid to tacky to waxy to dry, subshiny, sometimes becoming dull on drying, with a striate margin (10 - 25% (-35%) of the radius), nonappendiculate, incurved at first, then decurved or occasionally slightly incurved. The volva is absent or present in irregular patches or a mixture of low warts and patches of varying size, verruculose to nearly smooth, pale ochraceous becoming pale gray or pale gray with orange tint or pale grayish orange or (infrequently) gray, never very dark gray even in senescence, orangish tint often strongest over the center, weakly submembranous or felted to subpowdery, easily removed. 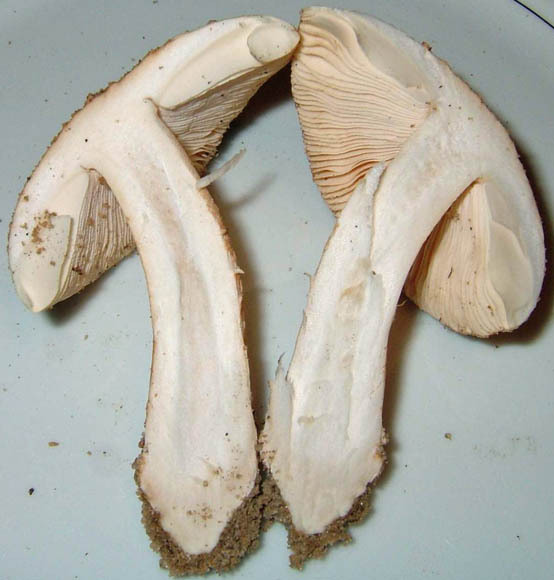 The flesh is white to off-white, concolorous or brown or pale brown or faintly gray under the cap skin, unchanging when cut or bruised, 2 - 8 mm thick above the stem, thinning evenly for about 70% of the radius to the entire radius or rapidly for 50% of the radius then evenly up to 75 - 80% of the radius, then membranous to the margin. The gills are free to distant or (occasionally) narrowly adnate, subcrowded to crowded, pale orangish white or pale pinkish or pale orangish cream or pale brownish cream or orangish cream in mass, pale cream with faint pink or orange tint or yellowish white or yellowish cream or pale yellow in side view, not changing when cut or bruised, 3 - 9 mm broad, with a short decurrent tooth on the top of the stem, with or without decurrent line on the top of the stem, with a minutely flocculose edge that is pale orangish or paler than face in young specimens, with edge sometimes concolorous (brownish) with the cap surface for a short distance at the cap margin. The short gills are truncate to subtruncate to subattenuate, of diverse lengths, unevenly distributed, and scatttered to common to plentiful. 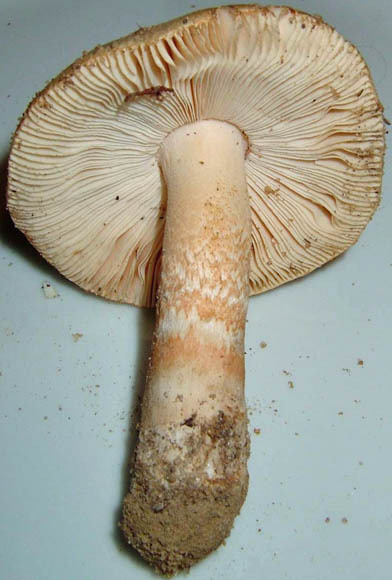 The stem is 57 - 135 × 6 - 14 mm, with a pallid to pale sordid cream to pale yellowish cream to pale orange-brown ground color, narrowing upward, flaring slightly at the top, with a rather strongly longitudinally striate white strangulate zone extending upward from near the base and sometimes bounded above or below by volval remnants as continuous narrow bands or rings of warts and patches, sometimes with rounded point at base, at first often covered from the top of the stem to the top of the strangulate zone with a fine layer of orange-white powder, later with fibrils and subfelted fibrils in chevron patterns (sometimes densest below mid-point) pale orange or pale orangish cream or pale ochraceous at first and then graying or becoming pale sordid brown or brown (eventually can be quite dark brown) with time or after handling (occasionally browning response to handling noted in ground color), becoming glabrous (at the top) and with the surface below the fibrils longitudinally striatulate. A ring is absent. The volva is present as a short-saccate or cupulate volva; or in rows of warts or patches circling the lower stem; or as a thin continuous ring around the stem and as a shallow and broken cup on the stem base, pale yellowish white when excavated, then orangish white to pale orangish cream to pale orangish gray to pale grayish orange to orange-tan after exposure, friable, uppermost ring or row of warts or patches are up to 61 mm from the stem base; occasionally also as irregular verruculose patches distributed over the strangulate region, often impregnated with sand. The flesh is white to barely off-white to cream to yellowish or tannish white, sometimes with orange tint in lower third, occasionally with brownish streaks, occasionally sordid off-white to pale gray, unchanging when cut or bruised, stuffed or hollow. 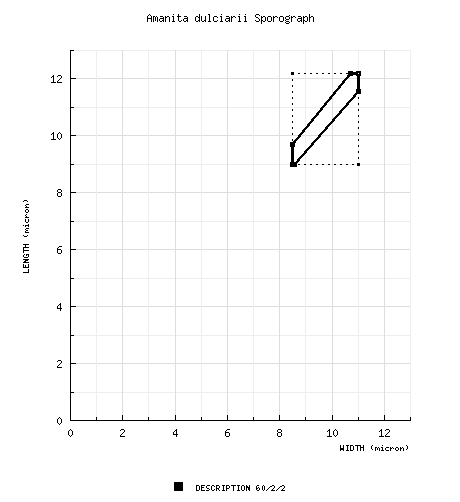 The spores measure (8.5-) 9.0 - 12.2 (-15.5) × (8.0-) 8.5 - 11.0 (-12.5) µm and are subglobose or (occasionally) globose or (infrequently) broadly ellipsoid and inamyloid. There are no clamps at bases of basidia. The range of this species extends from St. John Island (Province of Newfoundland and Labrador, Canada) to the Pine Barrens of southern New Jersey, USA. In addition, there is molecular evidence that it is associated with pine plantations in North Carolina—at least in areas with nitrogen poor soils (Edwards et al. 2004). etymology genitive of dulciarius (confectioner, maker of sweets); hence, "confectioner's"
The following is based on original research of R. E. Tulloss. pileus 34 - 85 mm wide, at first sometimes tannish yellow over disc and yellow with slight olivaceous tint otherwise except nearly white at margin, becoming brassy yellowish brown to brown to yellowish brown over disc with orangish tint near margin or brown over disc (e.g., 6E7) and slightly reddish brown (a little redder tha 5E8) to orangish brown (e.g., more yellow than 6D4) at margin or dark brown with reddish tint over disc and brown at margin or fuligineous over disc and Isabella Color (2.5Y 5.8/4.5) or a yellower brown at margin, sometimes not evenly pigmented and then palest region yellowish cream, faintly virgate for about 0.5 radius near margin or not noticeably virgate, campanulate at first, then broadly campanulate or subhemispheric to convex to planoconvex (often with low and broad umbo, sometimes in shallow depression) to nearly planar (often with umbo), subviscid to tacky to waxy to dry, subshiny, sometimes becoming dull on drying in situ; context white to off-white, concolorous or brown or pale brown or faintly gray under pileipellis, unchanging when cut or bruised, 2 - 8 mm thick at stipe, thinning evenly for about 0.7 radius to full radius or rapidly for 0.5 radius then evenly up to 0.75 - 0.8 radius, then membranous to margin; margin striate (0.1 - 0.25 (-0.35)R), nonappendiculate, incurved at first, then decurved or occasionally slightly incurved; universal veil absent or in irregular patches or a mixture of low warts and patches of varying size, verruculose to nearly smooth, pale ochraceous becoming pale gray or pale gray with orange tint or pale grayish orange or (infrequently) gray, never very dark gray even in senescence, orangish tint often strongest over disc, weakly submembranous or felted to subpulverulent, detersile. lamellae free to distant or (occasionally) narrowly adnate with short decurrent tooth on stipe apex, with or without decurrent line on stipe apex, subcrowded to crowded, pale orangish white or pale pinkish or pale orangish cream or pale brownish cream or orangish cream in mass, pale cream with faint pink or orange tint or yellowish white or yellowish cream or pale yellow (a little creamier than 4A3) in side view, not changing when cut or bruised, 3 - 9 mm broad, broadest between 0.75R and pileus margin, rounded at pileus margin, with edge minutely flocculose and pale orangish or paler than face in young specimens, with edge sometimes concolorous (brownish) with pileus surface for a short distance at pileus margin; lamellulae truncate to subtruncate to subattenuate, of diverse lengths, unevenly distributed, scatttered to common to plentiful. stipe 57± - 135+ × 6 - 14 mm, having pallid to pale sordid cream to pale yellowish cream to pale orange-brown ground color, narrowing upward, flaring slightly at apex, with rather strongly longitudinally striate white strangulate zone extending upward from near base and sometimes bounded above or below by universal veil remnants as continuous narrow bands or rings of warts and patches, sometimes with rounded point at base, at first often covered from apex to top of strangulate zone with fine layer of orange-white pulverulence, later with fibrils and/or subfelted fibrils in chevron patterns (sometimes densest below mid-point) pale orange or pale orangish cream or pale ochraceous at first and then graying or becoming pale sordid brown or brown (eventually can be quite dark brown) with time or after handling (occasionally browning response to handling noted in ground color), becoming glabrous (at apex), with surface below fibrils longitudinally striatulate; context white to barely off-white to cream to yellowish or tannish white, sometimes with orange tint in lower third, occasionally with brownish streaks, occasionally sordid off-white to pale gray, unchanging when cut or bruised, concolorous in larva tunnels, stuffed with densely to moderately loosely packed white cottony material or hollow and then lined with such material, with central cylinder 4 - 6 mm wide; exannulate; universal veil as short-saccate or cupulate volval or in rows of warts or patches circling lower stipe or as thin continuous ring around stipe and as shallow and broken cup on stipe base, pale yellowish white when excavated, then orangish white to pale orangish cream to pale orangish gray to pale grayish orange to orange-tan after exposure, friable, uppermost ring or row of warts/pathces up to 61 mm from stipe base, occasionally also as irregular verruculose patches distributed over strangulate region, often impregnated with sand. odor/taste Odor lacking or very faint. Taste ??. tests Spot test for laccase (syringaldazine) - instantly positive in stipe base below central cylinder extending 10 - 15 mm up along exterior of stipe and in some spots deeper within context and in some bits of volval remnants. Test voucher: Tulloss 10-26-97-B. [60/2/2] (8.5-) 9.0 - 12.2 (-15.5) × (8.0-) 8.5 - 11.0 (-12.5) µm; L = 9.8 - 10.7 µm; L’ = 10.1 µm; W = 9.0 - 9.8 µm; W’ = 9.3 µm; Q = (1.0-) 1.05 - 1.14 (-1.27); Q = 1.08 - 1.09; Q’ = 1.09), hyaline, colorless, smooth, thin-walled, inamyloid, subglobose, occasionally globose, infrequently broadly ellipsoid; apiculus sublateral, rather short to somewhat prominent, truncate-conic to cylindric; contents granular; off-white in deposit. ecology Solitary or in small groups. Massachusetts: In sandy soil of old woods of Fagus grandifolia with scrubby Pinus rigida and Quercus. New Hampshire: With Pinus strobus, P. resinosa, Quercus ilicifolia, and Vaccinum spp.] New Jersey: In sandy soil and decaying leaves of P. rigida-Quercus barrens of Atlantic Ocean coastal plain. Two nrITS sequences in GenBank (AY456335, AY456336) from an environmental study in North Carolina in a P. taeda plantation in "well-drained, sandy soil" (Edwards et al. 2004) are very close matches to our sequences from A. dulciarii. Hence, it is possible that the present species occurs as far south as North Carolina in leaky, pine-dominated eco-systems. material examined U.S.A.: MASSACHUSETTS—Barnstable Co. (Cape Cod) - Wellfleet, "Marconi White Cedar Swamp," 17.x.2009 Noel Rowe s.n. [Tulloss 10-17-09-A] (RET 448-10, nrITS seq'd.). NEW HAMPSHIRE—Carroll Co. - North Conway, Echo Lk. St. Pk., 16.viii.1995 J. Hurley s.n. (RET 155-7). NEW JERSEY—Burlington Co. - Brendan T. Byrne St. For., ca. Pakim Pond [39°52’49” N/ 74°32’02” W, 35 m], 20.x.1991 R. E. Tulloss 10-20-91-B (RET 034-2), E. Varney s.n. [RET 10-20-91-C] (RET 034-3), 18.x.1992 NJMA foray participant s.n. [RET 10-18-92-E] (RET 073-7), Cas Petroski s.n. [RET 10-18-92-C] (RET 073-5), Natalie Savinov s.n. [RET 10-18-92-D] (RET 073-6), R. E. Tulloss 10-18-92-A (RET 073-4), 26.x.1997 S. Hopkins, George Orsino & R. E. Tulloss 10-26-97-B (RET 271-8), 29.x.2000 F. Adotta & R. E. Tulloss 10-29-00-A (RET 323-4), 26.x.2008 Jim Barg s.n. (RET 447-3), Susan Hopkins s.n. [Tulloss 10-26-08-A] (RET 447-5, nrITS seq'd. ), 23.x.2011 NJMA foray participant s.n. [Tulloss 10-23-11-A] (RET 504-2); ca. Chatsworth, Franklin Parker Preserve [39.776° N/ 74.5354° W, 21 m], 3.xi.2013 Igor G. Safonov & Nina Burghardt s.n. [mushroomobserver.org #151170] (RET 577-8, juvenile–nrITS seq'd. ); ca. Chatsworth, Franklin Parker Preserve [ca. 39.8145° N/ 74.549° W, 30m], 12.x.2009 J. Burghardt, F. Wartchow, & R. E. Tulloss 10-12-09-A (RET 449-3), 12.x.2009 F. Wartchow & R. E. Tulloss 10-12-09-B (RET 449-9, nrITS seq'd. ), 25.x.2012 Igor Safonov s.n. (RET 555-8, nrITS seq'd. ), 30.x.2009 John & Nina Burghardt et al. s.n. (RET 449-8); ca. Chatsworth, Franklin Parker Preserve, Railroad East sector, 12.x.2009 F. Wartchow & R. E. Tulloss 10-12-09-B (RET 449-9, nrITS seq'd. ), 3.x.2010 John Burghardt s.n. (RET 468-9, nrITS seq'd. ); ca. Chatsworth, Franklin Parker Preserve [39.776° N/ 74.5354° W, 21 m], 3.xi.2013 Igor G. Safonov & Nina Burghardt s.n. 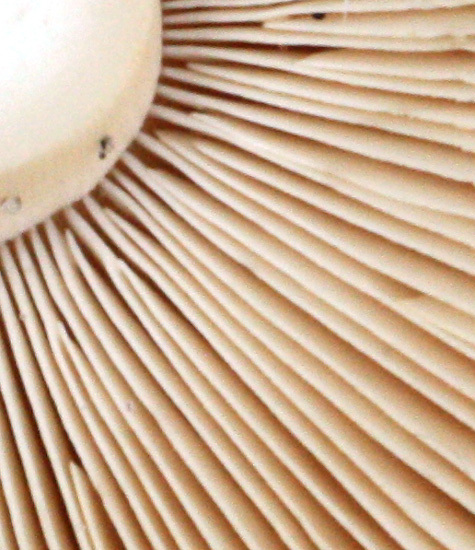 [mushroomobserver.org #151170] (RET 577-8, nrITS seq'd.). discussion The pilei of the larger specimens are rather fleshy for members of the group of taxa with friable universal veil. A review of all taxa in sect. Vaginatae with spot tests positive for laccase in the stipe base should be carried out. 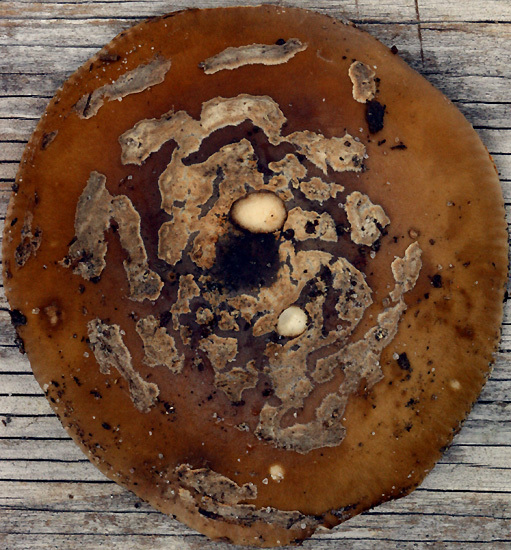 RET 577-8 is juvenile; there are very few spores present on the hymenium; and these are close to the stipe. It was first identified by it nrITS sequence. 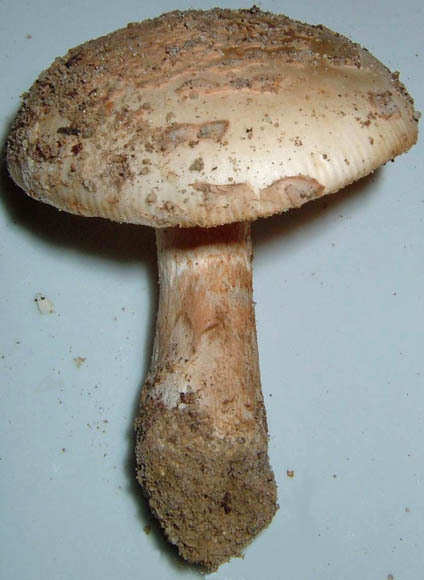 Its very pale cap indicates that the colors of this species can be late to develop or can be bleached away by sunlight. This should be investigated further. photo RET - (1-4) Brendan T. Byrne (=Lebanon) State Forest, Burlington Co., New Jersey, U.S.A.
select a collection to review/add spore measurements..#727035. J. Burghardt, F. Wartchow, & R. E. Tulloss, #10-12-09-A, U.S.A., NEW JE..#727036. John & Nina Burghardt et al., #s.n., U.S.A., NEW JERSEY, Burlington Co...#727037. Igor Safonov, #s.n., U.S.A., NEW JERSEY, Burlington Co., ca. Chatsworth..#727040. Igor G. Safonov & Nina Burghardt, #s.n.=>mushroomobserver.org #151170, ..#754477. Andrus Voitk, ##10, CANADA, NEWFOUNDLAND & LABRADOR, State John Island#782894. R. E. Tulloss, #10-20-91-B, U.S.A., NEW JERSEY, Burlington Co., Brendan..#782895. E. Varney, #s.n.=>RET 10-20-91-C, U.S.A., NEW JERSEY, Burlington Co., B..#782896. NJMA foray participant, #s.n.=>RET 10-18-92-E, U.S.A., NEW JERSEY, Burl..#782897. Cas Petroski, #s.n.=>RET 10-18-92-C, U.S.A., NEW JERSEY, Burlington Co...#782898. Natalie Savinov, #s.n.=>RET 10-18-92-D, U.S.A., NEW JERSEY, Burlington ..#782899. R. E. Tulloss, #10-18-92-A, U.S.A., NEW JERSEY, Burlington Co., Brendan..#782900. S. Hopkins, George Orsino & R. E. Tulloss, #10-26-97-B, U.S.A., NEW JER..#782901. F. Adotta & R. E. Tulloss, #10-29-00-A, U.S.A., NEW JERSEY, Burlington ..#782902. Jim Barg, #s.n., U.S.A., NEW JERSEY, Burlington Co., Brendan T. Byrne S..#782903. Susan Hopkins, #s.n.=>Tulloss 10-26-08-A, U.S.A., NEW JERSEY, Burlingto..#782904. NJMA foray participant, #s.n.=>Tulloss 10-23-11-A, U.S.A., NEW JERSEY, ..#782905. Igor G. Safonov & Nina Burghardt, #s.n.=>mushroomobserver.org #151170, ..#782906. J. Burghardt, F. Wartchow, & R. E. Tulloss, #10-12-09-A, U.S.A., NEW JE..#782907. F. Warchow & R. E. Tulloss, #10-12-09-B, U.S.A., NEW JERSEY, Burlington..#782908. Igor Safonov, #s.n., U.S.A., NEW JERSEY, Burlington Co., ca. Chatsworth..#782909. John & Nina Burghardt et al., #s.n., U.S.A., NEW JERSEY, Burlington Co...#782912. Igor G. Safonov & Nina Burghardt, #s.n.=>mushroomobserver.org #151170, ..#794068. Noel Rowe, #s.n.=>Tulloss 10-17-09-A, U.S.A., MASSACHUSETTS, Barnstable..#794069. J. Hurley, #s.n., U.S.A., NEW HAMPSHIRE, Carroll Co., North Conway, Ech..#794070. R. E. Tulloss, #10-20-91-B, U.S.A., NEW JERSEY, Burlington Co., Brendan..#794071. E. Varney, #s.n.=>RET 10-20-91-C, U.S.A., NEW JERSEY, Burlington Co., B..#794072. NJMA foray participant, #s.n.=>RET 10-18-92-E, U.S.A., NEW JERSEY, Burl..#794073. Cas Petroski, #s.n.=>RET 10-18-92-C, U.S.A., NEW JERSEY, Burlington Co...#794074. Natalie Savinov, #s.n.=>RET 10-18-92-D, U.S.A., NEW JERSEY, Burlington ..#794075. R. E. Tulloss, #10-18-92-A, U.S.A., NEW JERSEY, Burlington Co., Brendan..#794076. S. Hopkins, George Orsino & R. E. Tulloss, #10-26-97-B, U.S.A., NEW JER..#794077. F. Adotta & R. E. Tulloss, #10-29-00-A, U.S.A., NEW JERSEY, Burlington ..#794078. Jim Barg, #s.n., U.S.A., NEW JERSEY, Burlington Co., Brendan T. Byrne S..#794079. Susan Hopkins, #s.n.=>Tulloss 10-26-08-A, U.S.A., NEW JERSEY, Burlingto..#794080. NJMA foray participant, #s.n.=>Tulloss 10-23-11-A, U.S.A., NEW JERSEY, ..#794081. Igor G. Safonov & Nina Burghardt, #s.n.=>mushroomobserver.org #151170, ..#794082. J. Burghardt, F. Wartchow, & R. E. Tulloss, #10-12-09-A, U.S.A., NEW JE..#794083. F. Wartchow & R. E. Tulloss, #10-12-09-B, U.S.A., NEW JERSEY, Burlingto..#794084. Igor Safonov, #s.n., U.S.A., NEW JERSEY, Burlington Co., ca. Chatsworth..#794085. John & Nina Burghardt et al., #s.n., U.S.A., NEW JERSEY, Burlington Co...#794086. F. Wartchow & R. E. Tulloss, #10-12-09-B, U.S.A., NEW JERSEY, Burlingto..#794087. John Burghardt, #s.n., U.S.A., NEW JERSEY, Burlington Co., ca. Chatswor..#794088. Igor G. Safonov & Nina Burghardt, #s.n.=>mushroomobserver.org #151170, ..